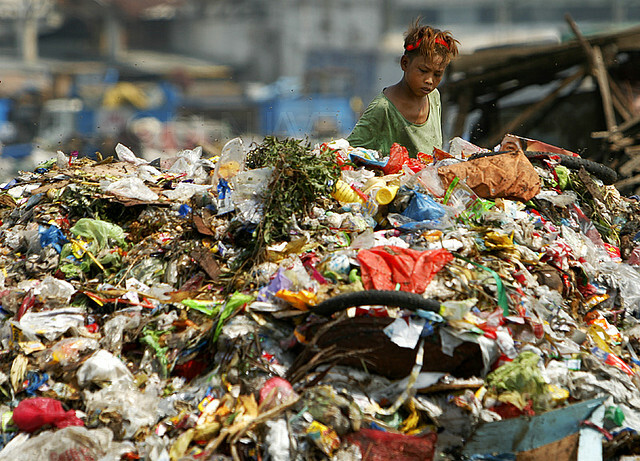 A young scavenger collect recyclable items from a garbage dump site. This photo is a symbol of non-ending story of poverty in the Philippines. The Philippines’ well-known survey firm, the Social Weather Station released its latest data on poverty level of our country where 52% of sampled Filipino families—equivalent to some 10.6 million families—described themselves as “poor” in March, down from 54% or 10.9 million families in December. The same survey also noted that 39 percent of respondents or 7.9 million families classify themselves as food-poor, down from 44 percent or 8.9 million families in the last survey. The SWS noted “significant gains” in in Mindanao, where self-rated poverty fell by 19 points to 53 percent and self-rated food poverty fell 20 points to 43 percent in December. In Metro Manila, however, self-rated poverty and food poverty scores stayed at 42 and 28 percent respectively. In the balance of Luzon, poverty rose by seven points to 50 percent and food poverty rose by two points to 36 percent. Poverty in the Visayas rose three points to 65 percent while food poverty fell by eight to 46 percent. The survey showed that the median poverty threshold, or the monthly budget below which a household considered itself poor, rose to P15,000 in Metro Manila and to P10,000 in the Visayas. It fell to P8,000 in the balance of Luzon and Mindanao. On the other hand, the median food-poverty thresholds were P8,000 in Metro Manila, P5,000 in the Visayas, and P4,000 in the rest of Luzon and Mindanao. The SWS survey involved face-to-face interviews with 1,200 household heads nationwide. Error margins of ±3% for national and ±6% for area percentages applied to the survey. Despite of slight improvements from previous December data, the self-rated poverty and food poverty rates have remain unchanged since 2006. These rates reflect that the programs of the government on poverty alleviation have not worked as expected, in spite of 5-6% annual GDP growth for the past 7 years. Urban poor groups like the National Urban Poor Sectoral Council, a coalition of urban poor groups through their secretary general Emmanuel Manato, told through GMA News Online that “The survey is not real according to our urban poor sector”, “In fact, the poor people have been increasing, lack of job opportunities are still there and prices have kept increasing”. These sentiments of the urban poor should be given a priority by our government on how to significantly reduce the poverty incidence rate. The government keeps trumpeting about the rise of the Philippine Stock Exchange Index and other appreciations from foreign companies, governments, or individuals, but these “achievements” according to our government cannot be felt in the near future by an ordinary Juan de la Cruz unless the government realize the need to improve our cost-of doing businesses here in our country as several stumbling blocks on doing business or job creation deteriorates the poverty problem in our country while prices keep increasing. The more prices are increasing while millions are unemployed means they are more vulnerable to price changes. Giving them meaningful jobs to these unemployed people for agriculture, manufacturing, mining, or oil and gas extraction can cushion them from volatile price changes. The government should not rely anymore on short-term and failed poverty alleviation like the Conditional-Cash Transfer where the intention is to give conditional cash to qualified poor families in exchange of requiring their children to attend school classes, parents have to work menial jobs like cleaning streets, and others. The government should not be in complacent mode, blaming the previous administration for their shortcomings, wasting the taxpayer’s money to finance candidates for the coming elections, and swindling the money for the enrichment of several politicians. Epic fail Philippine Daily Inquirer 20 April 2013 front cover issue with spoof Time magazine photo of President Benigno Aquino III. The Philippine Daily Inquirer or PDI, the leading broadsheet national newspaper is in the hot seat after they added a satirical Time magazine cover page of President Benigno Aquino with his mouth agape. 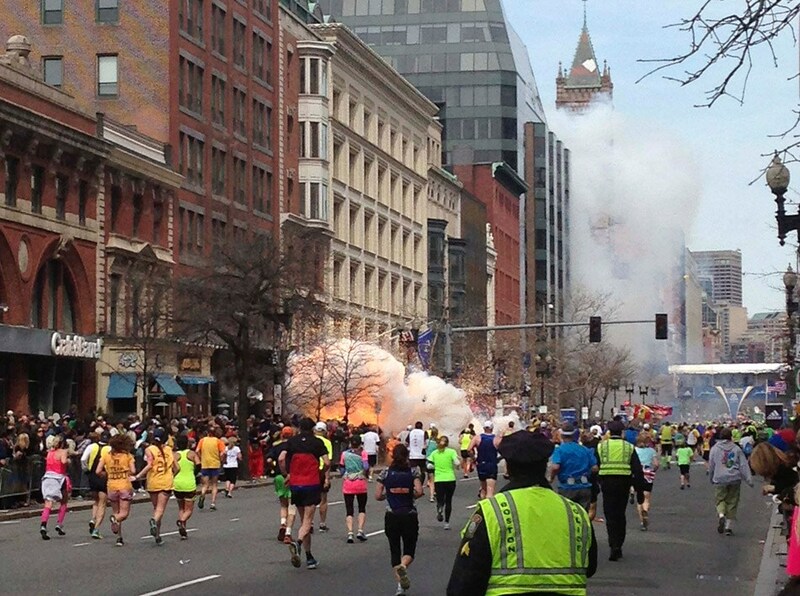 The picture, however, remained on the paper’s website on Saturday afternoon. Time named Aquino on its annual list of the “100 Most Influential People in the World“, however, he was not among the seven on the list who graced the covers of the magazine’s US and global editions, according to the magazine’s website. It took the Spin Busters blog site, a blog site dedicated to watch local press issues, for the Philippine Daily Inquirer to correct their web article about President Aquino’s recognition as one of the “1000 Most Influential People in the World” by the Time magazine. 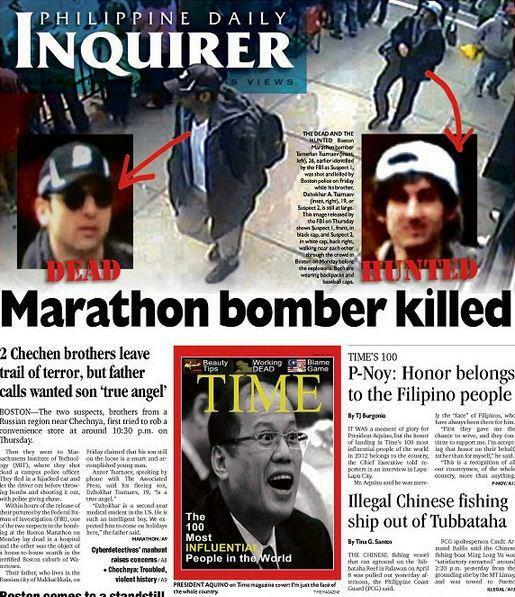 Indeed, this is an epic fail on the part of the Philippine Daily Inquirer. They should have checked the source of the photo intended for publication. Failure to verify photos for publication on print or web is tantamount to reader’s scrutiny about newspaper institution’s accuracy and credibility on delivering news. This is not a first time that the Philippine Daily Inquirer has published inaccurate and offensive photos on cover as last year, they published an offensive photo of defense witness Demetrio Vicente in unflattering poses during the impeachment trial of former Chief Justice Renato Corona and captioning a photo where President Aquino shaking his hands with a Muslim woman wearing a burka as a “Security Risk?”. The Philippine Daily Inquirer should not repeat their epic mistakes of publishing satirical, inaccurate, or offensive photos or captions. It has been four days after Margaret Thatcher died at the age of 87 after she suffered a stroke. I have decided to write this article today as her death is a big blow not just among the British people that she served for 11 years, but also to the world where during her premiership, the political tide had turned into a better and peaceful as her economic policies became an inspiration to defeat the evil ideology of her time, communism. Margaret Hilda Roberts Thatcher was an exceptional person who rose across the social rank from merely the daughter of a grocer to a prime minister of one of the great nations, United Kingdom. She defied the odds of her time that a woman prime minister will be impossible in her lifetime when in 1975, the Conservative Party named her as their leader which made her premiership possible, four years later as Great Britain suffered a terminal economic decline due to the excess of the postwar Liberal Consensus instituted by Clement Attlee. Her premiership was a difficult one especially during the first three years as structural economic reforms instituted by her like cutting excess social spending that made her doomed to be defeated by 1983 until an event in faraway Falkland Islands, controlled by the United Kingdom and resided entirely by British, was invaded by Argentina which had a long-standing claim with the islands. British forces was able to repulse Argentine invaders back to Argentina and the victory provided a lease of life for Margaret Thatcher’s premiership where she won for another two elections before she stood down in 1990. His economic reforms like downsizing the coal industry in Northern England, liberalization of the City of London, and imposition of Poll Tax had created enormous discontent from those who were affected and in fact, they never forgive her even the moment she died. Her economic policies brought Britain to be competitive with the rest of Europe instead of turning it into a third world cesspool that her critics wanted to describe her economic policies. Her strength of confronting the obstacles of her economic reforms became an inspiration especially in Eastern Europe to implement her economic policies in their respective countries that made them economically prosperous by now compared when the Soviet Union was in charge. Her death should be a time for mourning, whether you agreed her policies or not. It is a sad thing that in British itself, lot of its citizens are celebrating her death without realizing that once a upon a time, she led their country. They should not grunge their anger to Mrs. Thatcher alone as her economic policies were bound to happen had she never became the prime minister. Celebrating her death is tasteless and their celebration has become a precedent to do such thing if your enemy dies someday and it is a contrast of what the world is expecting to a British, a classy one. 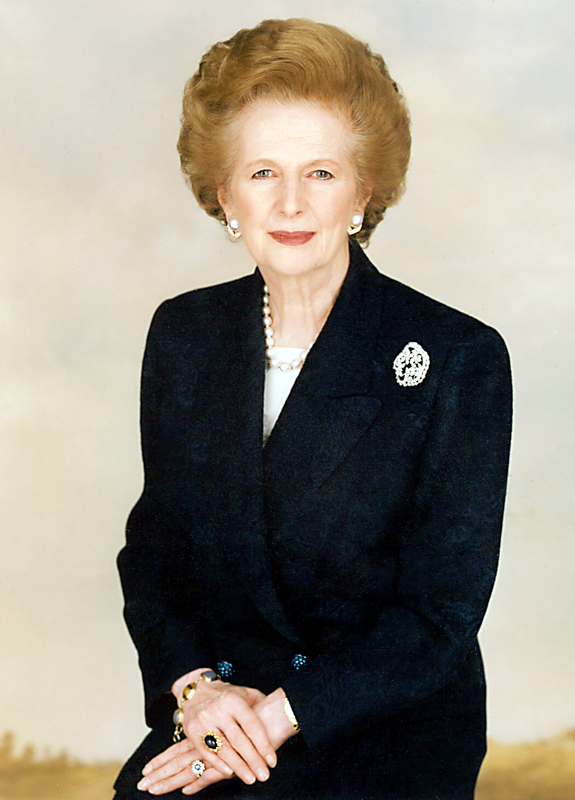 I would like to give my most sincere condolences to Margaret Thatcher’s family and to the people of Great Britain.